With over 35 years experience, Goldacres has long been the benchmark in value for money spraying equipment. 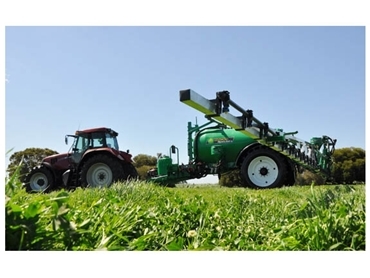 The special evolution is a proven design model which is suited for mid to large spraying applications and uses an extra strong chassis, tank sizes up to 5000 litres and boom sizes up to 30m. The Special Evolution spraying equipment features a EZ control station which is clearly labelled and straightforward to operate. All key filling and pressure functions are placed in one convenient location adjacent to the walk through platform and quick fill point which makes filling an efficient and simple process. Goldacres recognise that spray application is critical and so when manufacturing their products they make sure that the good quality components ensure a long service life which will allow you to focus on the job ahead with a sprayer that will be ready for any application at any time. The sprayers are in high demand as traded equipment and the strength of the product, support of the dealer network and high demand all work together to ensure the resale value of your equipment will make the changeover an easier proposition.